Shop our collection of women’s LNDR Skiwear. Functional, minimal and stylish. 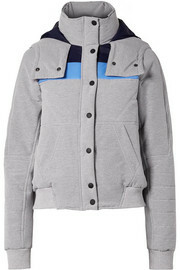 LNDR's cool yet practical pieces keep you comfortable no matter what your busy schedule demands. Made from quilted shell that's padded for light insulation, this striped design has a generous hood and ribbed-knit trims that help seal in heat. Wear it for running errands, grabbing lunch or heading to the gym. Knitted from a soft merino wool-blend, LNDR's headband is designed to keep hair in place and absorb sweat so you can focus on your intense spinning session or run. 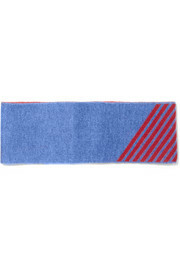 This vibrant light-blue style has diagonal claret stripes and a wide silhouette. Knitted on a circular loom for a streamlined fit, LNDR's 'Downhill Racer' top is made from highly breathable and quick-drying material that wicks sweat. 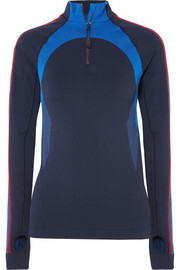 It has a high neckline and handy thumbholes - perfect to keep you warm during outdoor workouts. Getting ready to utter the words 'new year, new you'? We think the secret to making that resolution a success lies within some fresh workout gear. LNDR's 'Freefall' compression leggings have been knitted on a circular loom for a flattering fit and trimmed with stripes of blue, red and burgundy at the seamless cuffs. 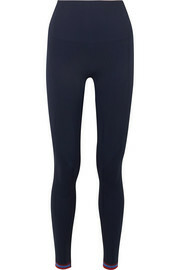 The sweat-wicking material is also antibacterial to reduce odor. LNDR's 'Downhill Racer' top is knitted on a circular loom for a smooth, practically seamless finish. 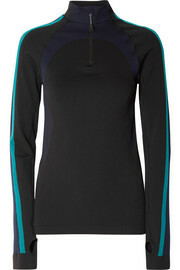 It's breathable and quick-drying, and wicks sweat from your skin. The zipped high neckline locks in the warmth on winter runs - use the thumbholes to keep the sleeves extended and your hands protected from the cold. LNDR's new outerwear range is just as effortless, functional and versatile as its celebrated athleisure collection. 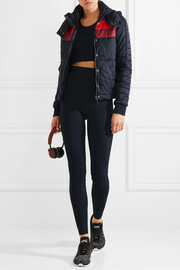 Made from quilted shell, this sporty 'Winter Breaker' jacket has a a detachable hood and ribbed trims to keep in warmth. The color-block stripes give it a cool retro feel.